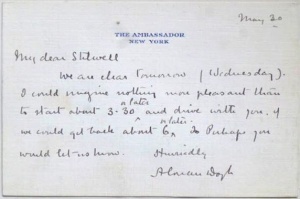 This notecard was written by Arthur Conan Doyle on 30 may 1922 from The Ambassador hotel, New York, to Arthur Edward Stilwell. Arthur E. Stilwell (1859-1928) was the founder of the Kansas City Southern Railway and author of a spiritualist book "The light that never failed: A tale of Australia, America and England". We are clear tomorrow (wednesday). I could imagine nothing more pleasant than to start about 3.30 or later and drive with you, if we could get back about 6 or later. Perhaps you would let us know. This page was last edited on 15 February 2018, at 00:45.